Restaurant owners have a head start in the world of social media. Customers already expect you to have a presence and to engage with them there so you don’t have to fight as hard as other industries to gain followers. Creating loyal customers, though, takes some thought and a bit of tactical maneuvering. If done well, using social media can be an easy and low-cost way to gain customer loyalty. Probably the best way to gain and retain the loyalty of your patrons on social media outlets is to offer exclusive offers they can’t get anywhere else. Make it one of the perks of following you. These types of offers often get great share traction, too, as followers share deals with their own social network. Making your social outlets a hub for announcing and advertising upcoming events like live music, drink specials, or charity nights is a great use of the medium. Consistently use your accounts, and you will create loyal customers who regularly check your pages and feeds for information about what’s happening at your restaurant. Peppering in a few surprise contests or giveaways keeps followers on their toes and checking back with you frequently. Don’t give away anything without asking for a share or a comment though — this will help organically boost your post. It might seem scary to ask your followers to engage with you, but in the end, the reason most people are on social media in the first place is to interact. Ask for feedback on a new menu item, or encourage people to share selfies at your restaurant. Then, make sure you thank them and comment on their posts as well. Always be polite and remain calm. Take the high road in any mud-slinging. Don’t make excuses, but instead offer resolutions. Apologize for bad customer experiences and any inconvenience. Invite them to private message you to resolve the issue. There are many things competing for your customer’s attention, especially on social media so you are going to have to earn your spot among the noise and make it through the priority filters. However, if you become a valuable social media resource and learn to harness its power, you will go a long way in creating customer loyalty for your establishment. Located on the outskirts of Echo Park, Mohawk Bend is one of LA’s ultimate places to enjoy craft beer and delicious locally sourced grub. Originally a 100-year old Vaudeville theater, Mohawk Bend invites diners & drinkers alike to enjoy it’s spacious covered patio or all brick dining room. Of course the bar is always welcome to enthusiasts who are interested in the 72 taps featuring a wide array of limited edition and craft beers. Mohawk Bend, now part of the Artisanal Brewer’s Collective, received Focus in early May, replacing an aging Aloha POS system. Focus’ goal was to provide enhanced reporting, while making it efficient for bartenders and servers to take care of guests. Part of the Focus POS system included several table-side tablets. These tablets, coupled with Focus’ quick speed of service features, allow staff members to quickly enter patrons orders while still providing excellent customer service. Check out Mohawk Bend next time you’re in the Silver Lake or Echo Park neighborhoods, we promise you won’t be disappointed. As a restaurant owner or manager you are in a constant state of strategizing, trying to move the numbers — like getting costs down and revenue up. One of the first places you can look for improvement is in your average check amount. Small bumps in this area can add up quickly in a week. 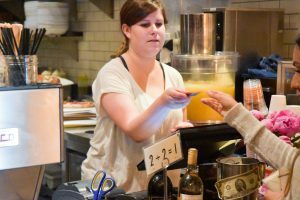 Learning how to upsell to your patrons is a low-cost endeavor that highly profitable restaurants, regardless of size, have learned to do effectively to increase average checks. Your staff, the waiters, bar keeps, hostesses, and cashiers all need to be salespeople. As the manager you set the tone and your goal should be to make the sales-mindset an automatic response. We’re not talking the pushy, in your face salesperson. No one wants that during a dining experience, but you do want upselling to be an integral part of customer interactions. When teaching your staff how to upsell, give them specific items to focus on for the shift, make sure they are ready to recommend favorite dishes and drinks, and have them plant seeds from the start like mentioning dessert selections while taking drink orders. Adding pairing suggestions to your menu is a subtle but effective tactic. Think beyond the wine list. You can suggest a specific side salad or appetizer that pairs well with each entree. By adding callouts and creative messages on your menu, you can steer your customers towards additional purchases while they’re still deciding what to order. Quick Service and Fast Casual operations can also upsell to their guests. While employee based upsells have been the mainstay of the QS & FC space for years, technology such as guest facing digital signage and POS-integrated interactive displays provides visual suggestions to guests. When brainstorming ideas on how to upsell to your customers make sure you consider online orders. Use technology to your advantage and list complementary food items and add-ons throughout the order process, especially right before check out. You are just a click away from nudging that average check up a few clicks. Daily specials and promotions are great motivators for customers to justify a more expensive meal or an excuse to have a beverage from the bar that they would have normally passed on. Not to mention, specials and promotions give your staff a great way to open up conversation, either at the table or when taking a take out order. How to upsell is not a big mystery, but it does take effort and a little forethought to make it part of your restaurant culture, whether fine dining or quick service. Training your employees to upsell, updating your menus to include suggestions, and offering specials are all cost effective ways to get your check averages up and ultimately increase your profits. It’s interesting to be in the point of sale industry. It’s especially interesting being in the POS industry for 10+ years. Technology has changed quite a bit in 15 years. Now we’ll take a look at how Mobile POS is impacting the restaurant industry. When POS systems were first introduced, they were clunky machines that took up a ton of counter space. As technology in the PC and gadget industry progressed, POS didn’t change all that much. We still saw large “computers” sitting on restaurant countertops and in server stations, taking up space and robbing restaurants of critical real estate. Fast forward to today, mobile POS is now a mainstream option. Many restaurants are recognizing the benefits of using POS systems driven in part by tablets. 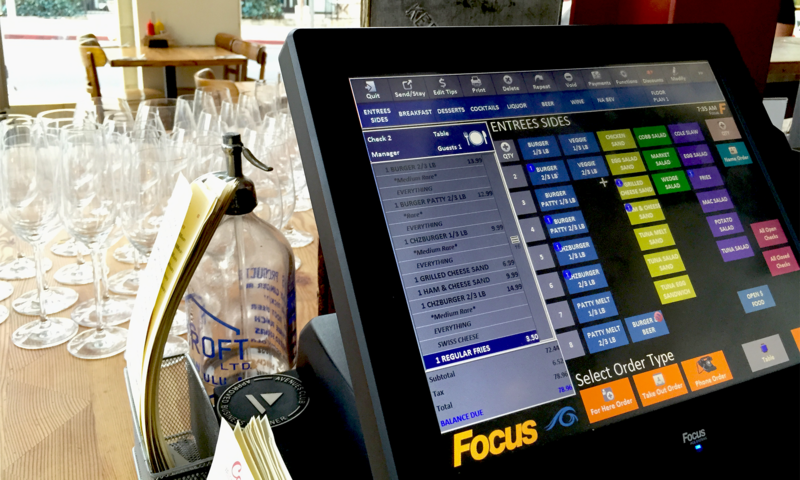 Restaurant operators are finding that blending POS solutions (a tablet coupled with traditional workstations for example) is also a recipe for success. In many instances, operators want a rock-solid and reliable workstation in the heavy use areas and an aesthetically pleasing tablet in guest facing areas such as hostess stands, patios and dining rooms. Some POS suites even offer tableside ordering solutions driven by mobile devices such as Apple iPod Touch or Apple iPad Mini. These gadgets are quickly becoming tools in the hands servers throughout the restaurant industry. There are many in the industry that feel that equipping servers with a tableside ordering unit gives off the wrong vibe. While there may be some truth to that, the proper use of these tools can streamline a restaurant’s operation. Let’s look for a moment at a restaurant with a large dining room. When “Sally” goes to service her tables, she is often going out loaded with drinks, food or checks to drop off. Obviously we want to maximize Sally’s time. We all know the adage full hands in, full hands out. What happens after Sally services her tables? What is she bringing back with her? Possibly some dirty plates or empty glasses, but often times she is heading directly for a POS station to input the next round of drinks or the next course for her guests. Now what if we equipped Sally with a device that could allow her to get that next round ordered while she is still crossing the dining room? That would improve Sally’s and the restaurant’s overall efficiency. Investing in mobile POS technology can bring impressive benefits to your restaurant. There are a few items to consider when reviewing options for mobile POS. Can my current POS support mobile technology? Do I have the infrastructure in place to allow for mobile POS? If I add streamlined mobile POS to my current environment, what unintended consequences will I run in to? Can my kitchen/bar handle the increased ticket traffic? Can my staff properly utilize the tools while still maintaining the same level of service? Can management enforce the necessary policies for staff to use these handheld devices? How will my guests react to tableside ordering? What is the cost versus return? Mobile POS technology can be an awesome advantage to restaurants, so review your options and see if your operation would benefit. 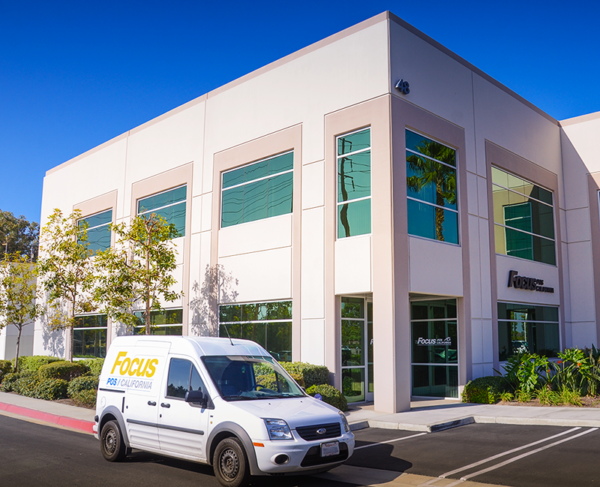 If you’d like further information on the mobile POS solutions available from Focus POS California, feel free to contact us at info@focusca.com or call us at 877-362-8440.